Diary: 'Hacker reveals Harry Potter ending"
A COMPUTER HACKER has broken into the database at Bloomsbury Books and read the new Harry Potter book, a month before it is released, I heard this morning. The hacker, who calls himself Gabriel, claims to have read the book and has posted, on the internet, the long-awaited ending to the series. Some people in the industry claim that this is probably a hoax, but there’s really no way of telling until the book is out. So what really happens at the end of the seven-book series? Well, while everyone is expecting one death (JK revealed that would happen a long time ago), there are actually two major deaths, he says. No, I’m not going to reveal the ending here -- people who are reading the series shouldn’t have it spoiled for them. YOUR IDENTITY is your book and your book is your identity. This adage that I have been preaching to new writers for many years was spectacularly proved true in a court hearing announced today. A Manhattan judge ruled that author Laura Albert was wrong to sign a film contract in her pen name, JT Leroy. She has to pay restitution to a film company which thought JT was a real person. On the surface, this case looks absurd: who cares if the book is signed by a person’s real name or pen name? Look at Mark Twain -- he signed all his books with his pen name, although his real name was Samuel Clemens. But the film company, Antidote International Films, claims that since the name on the contract was not that of a real person, Ms Albert, 41, must pay them back all the money for the advance plus legal fees -- which all adds up to more than US$100,000. Why? Because the filmmakers were enchanted by the personality of JT Leroy, said to be the waifish son of a prostitute who worked at a truck drivers’ roadside stop. Once they discovered that the real author was female and a mother without any connection to prostitution, they lost interest in the project. The judge agreed that the author had defrauded the film company. This is great news for author Laura Albert. Yes, she’ll lose a small fortune in the handling of the case. But during the hearings, her obsession with her alter ego was revealed and it is startling stuff. For example, she spent years talking to her shrink in the voice of a teenage male. I predict it will eventually become obvious that Laura’s own story is more interesting than anything she has written: the identity lit principle will take over -- and the author's life tale will make both a great book and a great movie. THE PARODISTS are getting restless! The third in the Barry Trotter series is on the market for foreign language rights and has just been sold to a Korean publisher namd Book@books, I heard this morning. The deal was brokered by the US agency McIntosh and Otis. These books, which have alleged sold 400,000 copies, are affection spoofs of Harry Potter. The author is Michael Gerber and the original publisher is Gollanz. The books are fun, in a silly sort of way. And you have to love the humor of the titles. The first was called Barry Trotter and the Shameless Parody. It was followed up by Barry Trotter and the Unnecessary Sequel. The latest is Barry Trotter and the Dead Horse. Meanwhile, on a more serious note, the Chinese character rights (complex characters -- ie Hong Kong and Taiwan) of Napolean Hill's classic money book Think and Grow Rich have been sold to Locus publishing. I predict that’s going to do well here. Now this next bit of news is a bit weird -- and discomforting to yours truly. A mystery buyer has bought an A380 super-sized double-decker jet for private business purposes. The deal (with no name attached) has leaked out of the recent Paris air show. The planes are huge and cost almost third of a BILLION US dollars -- a pretty expensive taxi. What’s strange about that? It this world of free-spending billionaires, nothing. Except it’s a key part of the plot of the next feng shui detective book, which I delivered to the publishers several months ago, but which won’t appear until the end of the year at the earliest. Further more, environmentalists are up in arms over the deal (just as they are in my novel). One said that buying an A380 for private business use was like buying a power station to charge your mobile phone. It’s a good quote, but too late to sneak into the book. That’s the trouble with being a fiction writer. Reality has this habit of creeping up and overtaking on the left. There are some brilliant authors booked to appear at the Galle Literary Festival in Sri Lanka in 2008. It’s well worth making the journey -- more news on that later, as the big names are confirmed. But save the dates: the middle of January. We’ve got some interesting postings on our www.hongkongchanges.com website, about the anniversary of the handover of Hong Kong. Those of you who have an interest in the place, take a look. But to go back to the theme of parodies, where we started: If you are into this sort of humor, check out Adam Roberts’ series of Tolkien spoofs. And my favourite: The Sellamillion. NICE LITTLE SCANDAL has broken out at Waterstone’s, the famous bookshop chain in the UK. The Times caught them sending out price lists to publishers for a slot on their “paperback of the year” lists and window displays. So while the customer thinks that a book is recommended because it is a good book, it may just be that cash has changed hands. Local booksellers in Hong Kong are not mercenary in this way, I am happy to report. With both Dymocks and Bookazine, they will feature books prominently on their shelves on catalogues without demanding sneaky fees under the table. Mitch Albom is heading for the big screen. 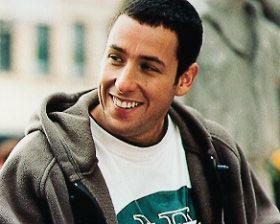 Adam Sandler (pictured) has signed a deal with Albom, author of the mega-bestsellers Tuesdays With Morrie, The Five People You Meet in Heaven and For One More Day. Albom (whose agent is CAA) has written a screenplay -- apparently a comedy with a baseball theme -- and has sold it to Sandler’s company. The jump from book writer to screenplay writer isn’t such a big one for Albom: he has already written TV movies based on his books. The writer, formerly a sports reporter for the Detroit Free Press, is sort of returning to his roots by writing about baseball. Local bookstores in Hong Kong are going mad for the Harry Potter market. Bookazine is opening at 7 am on July 21 to sell the final Harry Potter book, offering customers a big discount plus a free bag (bearing the name Harry Potter and the Bookazine logo) plus a souvenir bookplate. Dymocks is also being creative, with discounts and a bag. It’s all a big expense, and will ensure that booksellers will probably make a loss on the new book. Brainy professor Stephen Hawking has written a children's book with his daughter Lucy Hawking, a novelist. George's Secret Key to the Universe is a bout a boy who finds himself on an adventure in which he learns about the nature of physics, time and the universe. (I'm a bit nervous about promoting this because it sounds a lot like my book, Twilight in the land of Nowhen -- but no doubt will get a bigger marketing budget!) Anyway, the prof has sold the rights to Simon and Schuster Children's. I was thrilled to read in the press today that eating foie gras (goose liver produced by cruel means) can cause a deadly disease. Tests show that eating the livers of force-fed geese can lead to amyloidosis, which leads to organ failure, according to medical scientists. There IS a God. ABOUT TO BE LAUNCHED is a so-called "make-your-own audio book" machine. At least, that’s what reviewers have been saying about the Samsung YV-150. It’s basically a small machine that you can input text files into. Press a button and it reads the files out loud. It will be initially launched in China at 1,299 yuan for 512 MB and 1499 yuan for 1 GB. But is it really an audio book machine? What rubbish. Reviewers who write that are just showing that they know nothing about audiobooks. The quality of the actor reading the words is the beginning and end of whether an audiobook works or not. A robot voices reading in a monotone? No thanks. Chuck it in the bin. 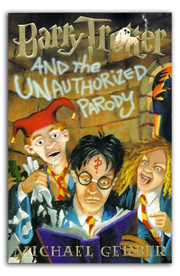 By the way, the unabridged audiobook version of the most recent Harry Potter took more than 20 hours to listen to. Now here’s one book Oprah Winfrey will not be promoting. Her father Vernon is writing a book about her, called Things Unspoken. She told the Daily News: “The worst part of it was him saying, 'I meant to tell you I've been working on it.' I was upset. I won't say 'devastated,' but I was stunned. 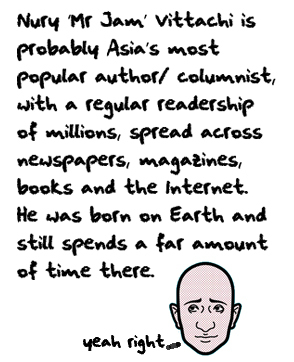 The last person in the world to be doing a book about me is Vernon Winfrey. The last person." Your columnist is back after a too-long absence. Apologies for the silence. I think I overdid it a bit on my Australian sojourn, and came back to my office in Hong Kong to face a pile of work which had to be tackled with zero energy. They say that “a change is as good as a rest” but I’m not sure that’s true. John Wiley, the world’s biggest independent non-fiction book company, is looking for editors at its headquarters in Hoboken, New Jersey. Some of the trendy hang-outs in Hong Kong are adopting dress codes. Now this is getting weird. Almost ALL the swankiest designer shops are full of old-looking torn jeans. So what is the dress code these days? Will “no entry in torn jeans” be replaced by “entry for those in torn jeans only”? If you turn up looking smart will you be ejected? “My book deal ruined my life”: that’s the title of a good piece in the New York Observer this week. Reporter Gillian Reagan interviews a host of authors and gets them to talk about what it’s really like. The feature is a welcome antidote to the authorial superstar puff pieces we constantly get in the press about JK Rowling’s millions and the latest successes of Stephen King and John Grisham. THE DAY started beautifully. I was picked up from a very fine hotel by my publicist, a bright and attractive young woman named Sonia, and placed into a car (with VIP written on the side!). Our task for the day was to meet our adoring public. It was a dream come true. As we scooted down the road towards the Sydney Writers' Festival theatre where the audience was waiting, I remarked that I was interested in meeting Jacqueline Wilson, who was also due to appear at the same theatre that day. Sonia smiled and assured me that we’d meet the celebrated British author. “Now there’s someone you don’t want to be sharing a signing table with,” she laughed. I laughed too. 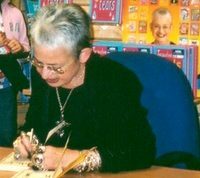 Jacqueline Wilson is wildly popular, having sold 20 million books in the UK alone –-- which is staggering when you think the entire population is 58 million and many of them don’t read books. Her signing queues are legendary --– they stretch, sometimes literally, for miles. On one famous occasion, she signed books for nine hours before the crowds finally thinned. We arrived at the theatre, and I was very happy to meet Ms Wilson offstage, and I sneaked into the theatre with several hundred children to listen to her speak – she was great: unassuming, natural, and very easy-going. This was a pleasant surprise for me: I think of her in the author superstar bracket, not quite JK Rowling, but only one step lower. All the “performances” if we can call them that, went very well. And then all four authors were ushered into the foyer to sign autographs. 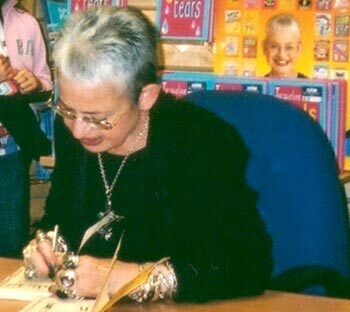 “You’ll be sharing a signing table with Jacqueline Wilson,” a theatre staff member told me. What!? I opened my mouth to speak but no words came out (rare for me). I did a passable impression of a gobsmacked trout. Two of the authors had been placed at one end of the theatre, and two at the other. I was sharing a table with Ms Wilson at the front of the foyer. Within seconds, so many children had surged in front of us that the whole place seized up. We were told by staff the crowd was blocking access. Our table was lifted up and moved back as far as it could go, almost into the next hall, which was a restaurant. A massive queue built itself up in front of “Jackie” as we referred to her by then. I realized that I would just have to make the best of it. All authors fear book-signings to some degree – perhaps no one will be interested and I will be sitting there all alone, my lack of appeal on display in the most blatant and humiliating fashion. But when you are sharing a table with a superstar, extreme humiliation is guaranteed. Oddly, I found myself not caring in the slightest. Why was this? I did a bit of introspective thought. First, I was so thrilled to have established a quick, easy acquaintanceship with someone who was a long-term hero of mine, that I was feeling great. I was caught up in the same wave of worship as were the kids in front of us. Second, you can only be humiliated if there are people looking at you, thinking (or appearing to think): look at that poor guy, sitting there all by himself. But almost no one was looking at me, and no one was thinking negative thoughts. The crowd was all children, and youngsters don’t have the sort of political, over-sensitive, over-analytical way of thinking that adults have. So I found myself happy and relaxed as teachers marshalled flocks of children into lines. And then I was delighted to find a queue building up in front of my bit of the table. I realized that I had been saved from complete abandonment by two factors. Ms Wilson was not nearly as famous here in Australia as she was in the UK, so her queue was long but not obscenely so. And then there was the fact that she is a straightforward speaker: she spoke well, but her talk was a rather calm, didactic chat about her writing and her career; in contrast, I approach audiences as an entertainer or comedian and had managed to get the kids shrieking and high as kites. So the more excitable youngsters raced for my autograph instead. In the end, I had to stop signing well before she did – not just because her queue was longer, but because the bookshop had sold out of my books. The journey from dream to nightmare and back to dream again is surprisingly short.